Health Hack winners Adam Hecht, Victor Hsue and Mark Keroles developed HoruScope, a home ophthalmoscope optimized for telehealth visits. Over three days, some 250 participants came together to form 26 teams dedicated to collaboration, innovation and the creation of solutions to some of healthcare’s most pressing problems. 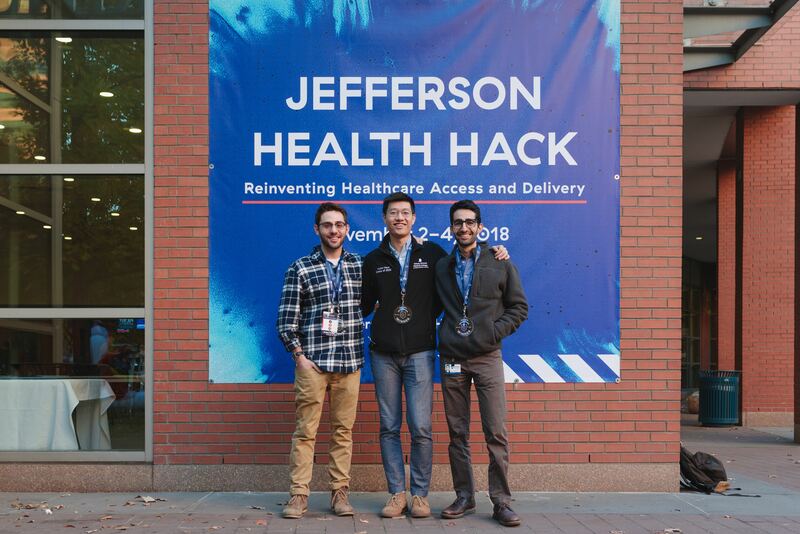 The University’s third Health Hack differed from typical “hackathons,” as students and professionals from all backgrounds and industries came together to pitch apps, prototypes and business concepts in three distinct tracks: Healthcare with No Address, Wearables and Data Science, and Medicinal Cannabis and Hemp. Judges—a mix of University staff and external experts in their respective fields—awarded one grand-prize-winning team in each track $5,000. Judges considered originality and creativity of the idea, progress made from concept to prototype, and the potential of the idea to one day influence or become a product. Healthcare with No Address winners Adam Hecht, Victor Hsue and Mark Keroles developed HoruScope, a home ophthalmoscope optimized for telehealth visits. The device would assist with interventions for prevalent chronic conditions that often impact the eye. “A lot of systemic diseases, such as diabetes and hypertension, affect the eye early on, so early detection can make a difference,” Keroles said. Hsue and Keroles are third-year medical students at Sidney Kimmel Medical College, and Hecht is an industrial design senior in the Kanbar College of Design, Engineering and Commerce. The winning team in the Medicinal Cannabis and Hemp track, Convey, dreamt up an app that would better share information with medicinal cannabis patients. It would aggregate information about cannabis strains, products and dispensaries and help match the best products with patients, depending on their condition. They hope to further develop the app to include feedback from patients so that the app “grows” to provide better suggestions. Team member Hayden Hughes, just a senior at Sterling High School in New Jersey, was inspired to pitch thanks to a friend who had attended Jefferson’s recent JAZ Tank: CannaVATION. The team also included Annaya Ahmand, a Jefferson psychology student; Anthony Allen, David Rehmat Jr., Chris Curotto and Daniel Hoffens, all developers and engineers; and guest observing student Tyree Robinson of Camden County Technical School.